Belgrave Square was designed by architect George Basevi, who laid out the square and the gardens were first planted by Thomas Cubitt in 1826. They have been restored to the layout of 1867, and have lawns, large plane trees, pergolas with wisteria, roses and annuals, a quiet garden, tennis court and play area for children. In 2008 the original viewing mound in the centre of the garden was re-instated and among the trees are those that date from the original plantings. Within the garden is a collection of statuary, including modern figurative works. LBI: nos. 1 - 11, 12 (+ railings/gate piers LBII*), 13 - 23, 24, 25 - 36, 38 - 48.LBII*: no. 49 + railings/gate piers; LBII: no. 11a. 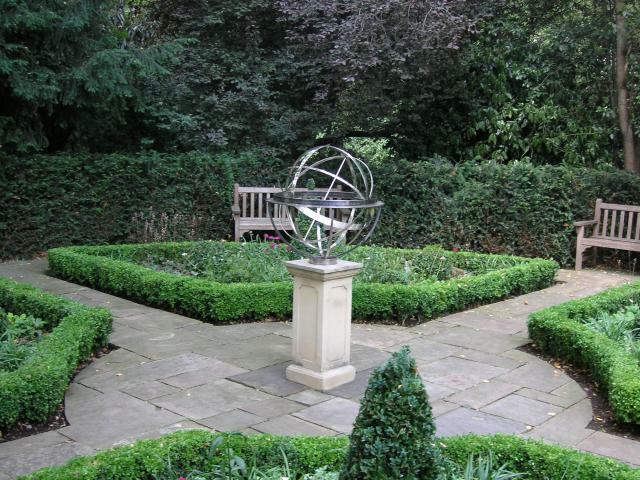 Has taken part in Open Garden Squares Weekend 21 times, most recently in 2018. No music, no wheeled vehicles or bicycles other than wheelchairs, children's tricycles, prams, pushchairs; no ball games by anyone over 5 years old. Belgrave Square, Eaton Square, Chester Square and Wilton Crescent (q.q.v.) were on land formerly known as Five Fields on the Grosvenor Estate's holdings in Belgravia. In 1677 the family had acquired c.121 hectares of land within the Manor of Ebury, but this area remained undeveloped and largely used for market gardening until the early C19th, due to its predominantly marshy nature. In 1821 Lord Grosvenor, 1st Duke of Westminster, commissioned his surveyor, Thomas Cundy, to revise an earlier unexecuted scheme produced by Thomas or James Wyatt in c.1812, for draining and developing the site immediately to the north of John Nash's remodelled Buckingham Palace (q.v.). Cundy's plan, which added Wilton Crescent to the planned Belgrave and Eaton Squares, was completed in 1825 and building leases were then sold, with the main developer being Thomas Cubitt (1788-1855). The overall plan comprised a series of squares and crescents connected by a spine road on the main axis and a subsidiary axis. Under the original agreement, Lord Grosvenor was responsible for the enclosing and planting of the gardens but not for the considerable site works necessary before any planting could begin. Cubitt solved the problem of the marshy ground by bringing earth excavated from St Katharine's Dock near the Tower of London in order to raise the height of the ground. Belgrave Square was the first square to be laid out early in 1826, followed by Wilton Crescent in 1827. Eaton Square, also begun in 1827 was not completed until 1853. Chester Square was the fourth square to be laid out but although it was planned in 1828 it was not begun until 1835. The development of Belgrave Square was begun in 1825 by Thomas Cubitt, with George Basevi as architect, and completion of the square was c.1827. Belgrave Square is named after the Leicestershire village of Belgrave, one of the Grosvenor family properties. The quantity of earth and soil needed for the garden may have come from the Lowndes Estate across the Ranelagh Sewer or from the excavations then going on for St Katharine's Dock. Basevi laid an estimate for the making of the 'enclosure' before Lord Grosvenor in June 1826, and was told firmly that he would 'allow £2,700 if Mr Basevi or his Employer will do it, or his Lordship will execute it himself if they object to that'. An arrangement was reached by which John Allen, one of the original garden tenants, was to be approached by Cundy to make the garden. Basevi was to arrange for the actual enclosing of the central garden with appropriate rails and granite curb. John Allen, who had a nursery garden at the west end of Eaton Square and planted Eaton Square, appears to have turned the job for Belgrave Square down. The very extent and size of the trees in the garden prevent the Square from reading as an architectural unity today. The railed garden enclosure is surrounded by a belt of shrubbery that encloses a peripheral path, with lesser paths running through lawn towards the centre of the garden. The lawn at the centre is raised to a `mount' with an area of rose bedding. This inner circle has a perimeter path with a number of small classical-style shelters and wooden pergolas with roses and lavender, with lesser clumps of shrubbery around the central area. Mature trees in the gardens include fine plane trees, lime, ash, chestnut and acacia, with smaller trees and shrubbery including bamboo, flowering cherry, fatsia, holly, laburnum, laurel, lilac, mahonia, philadelphus and thorn. In the south-west centre of the garden are tennis courts and a shelter. A small garden was created for the Millennium donated by the 6th Duke of Westminster, reached through a gate with a metal arch. It has a central steel sundial in the shape of a globe with etched inscriptions and is on a stone plinth from which four paved paths radiate, between which are four beds with box hedges, and planting includes alium and euphorbia, each having a vertical wooden trellis feature.